As most of the WhatsApp users know, it’s a paid app after you use it for one year and they charge 99 cents/year though you can get the service to your phone number at a reduced rate if you subscribe for 3 years/5 years and many people I’ve seen who even buy a new SIM card and use it for that purpose as they cost very less and they get also new offers with a new connection. Sometimes I feel quite irritating when someone changes his number and doesn’t inform me and neither deletes his/her old account and I keep on messaging to that number. So’ here’s something that WhatsApp is now offering for people who wanna gift their friend something. 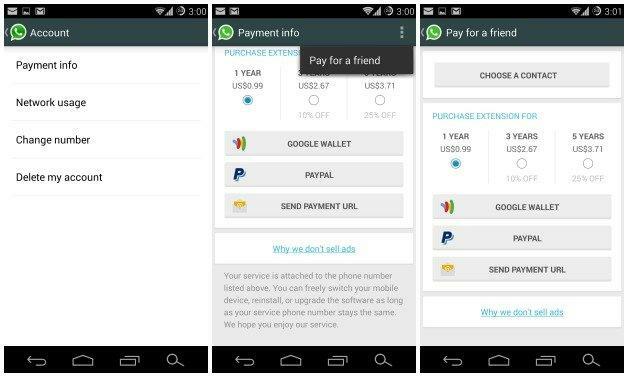 Now you can pay fot your friend’s WhatsApp just like taking him/her for a coffee and that’s quite a nice one for students like me, as I won’t now pay for my WhatsApp. I’m just gonna ask Dad to buy me one as he is a regular WhatsApp user and we communicate a lot with that. And the you can buy the service for your friend for 1 year, 3 years or even upto 5 years just like you get the chance to get some discount on your own account. It’s just a good idea to promote their service also. There might be someone whose account has expired and din’t pay after that for extension and you want to stay connected with him, just buy him a subscription. That’s a good idea and this might be quite helpful for people who this kind of situations.